Calibration masses are available in electronic balance and precision analytical. Electronic balance calibration masses are cylindrical shaped for easy stacking on balance weighing pans. 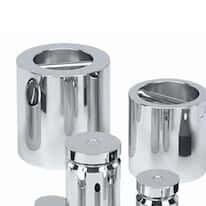 Precision analytical calibration masses feature two-piece construction and consist of a special austenitic alloy for high precision and stability. Both types of calibration masses meet ASTM Class 1 or ASTM Class 4 standards and are available with either a NVLAP Lab Code 105013-0 (National Voluntary Laboratory Accreditation Program) or traceable certificate.